Do you ever think that “you can’t see the forest for the trees”? You’re all set to teach counting skills in your second or third-grade class. You have your curriculum maps, your standards, your objectives, your “I Can” posters, your lesson plans, your materials all ready to go. But if those are the trees, what is the forest? The forest is your “why”. 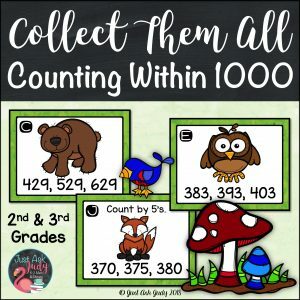 Why do you need to teach counting skills; to 1000, no less? Counting sequences help children develop an understanding of the relationships among numbers. Understanding these relationships helps them compute fluently and efficiently; to do the math mentally. It also further develops their ability to apply this to problem-solving situations. Children who have difficulty with mathematics frequently lack adequate counting skills. One way you can provide the opportunity for your learners to develop these skills is by implementing counting routines in your classroom. 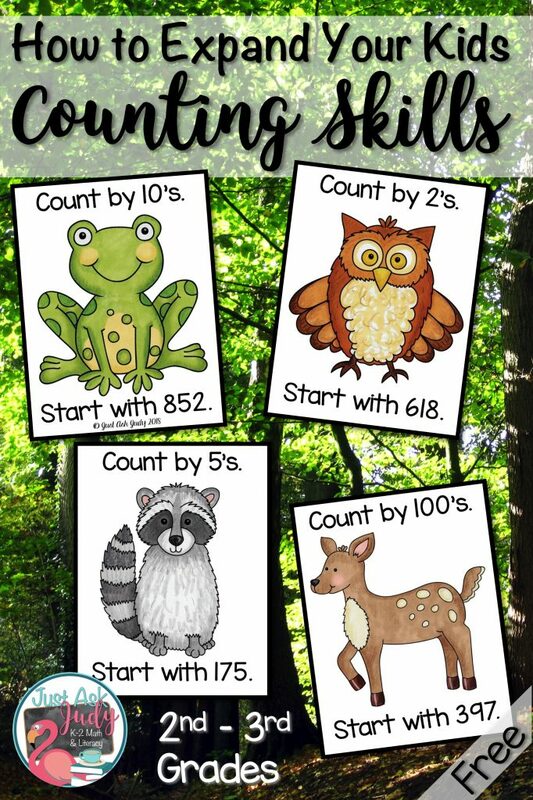 I created these free, easy to prepare Forest Animal Prompt Cards to implement as part of your classroom counting routines. You can use these with the whole class, small groups, or in an independent math center. All you need is a few minutes here and there. There are cards for counting by ones, tens, fives, twos, and hundreds. There are prompts to count by both multiples and non-multiples. Also included are prompts to count backward to increase mental flexibility and to challenge some of your learners. Pick a prompt card appropriate for your learners. Choose a counting routine. Decide when to do it. It’s as easy as that! Jessica F. Shumway has a wonderful chapter on Counting Routines in her book, Number Sense Routines: Building Numerical Literacy Every Day in Grades K-3. Some of my favorite routines from her book are Count Around the Circle, Choral Counting, and Start and Stop Counting. Have your students sit in a circle. Count around the circle by taking turns saying the next number in the sequence. Be sure to teach them to say all the numbers in their head and to give adequate wait time for their peers. No need to get in a circle. They can also count around the classroom, as they line up, in a line, or as an exit ticket from a group. Use choral counting to practice new routines and provide support for all your learners. Make sure everyone participates. To enhance engagement, add in movement (clapping, jumping, squatting, etc.). For start and stop counting, provide a stop number. Do this verbally or display the written start and stop numbers. Students count chorally or take turns saying the next number in the sequence. Stop on the given number. Add a little fun with a count around sit down variation. Have everyone stand in a circle. Whoever says the stop number sits down. Start the counting sequence again. Use the same sequence for repetitive practice or try a new one. Who’s the last one standing? This works best with shorter sequences. For a visual aid, write the numerals as your learners count. Write them in a number line, list, or number grid (think hundred chart) format. Doing this also provides an opportunity to discuss patterns. Refer to the chapter on Counting Routines in Jessica Shumway’s book to see numerous examples. Use the prompt cards in an independent math center for accomplished counters. Choose cards to match their skill level. Print the optional recording sheet. They can also record their responses on plain paper or dry erase boards as well as practicing counting orally with a partner. Let these prompt cards be another tree in your forest! 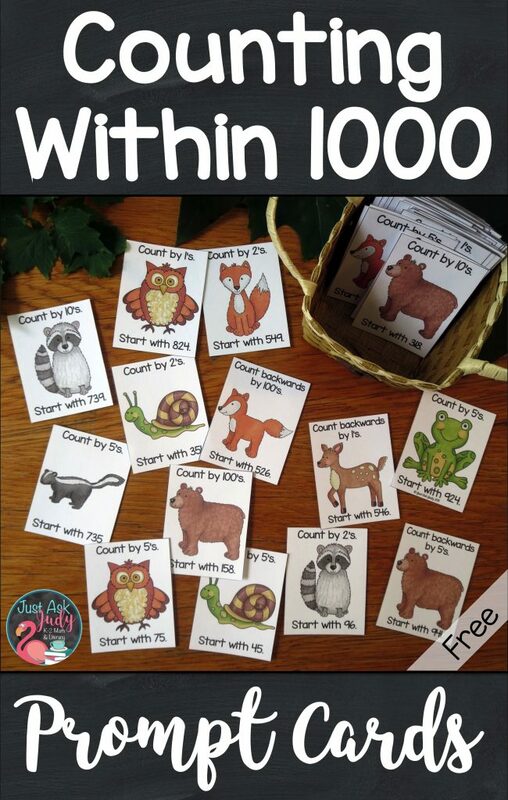 Click on the highlighted words, Counting Within 1000 Forest Animal Prompt Cards, to download this free resource from my TpT store. Share your favorite counting routine in the comments below. 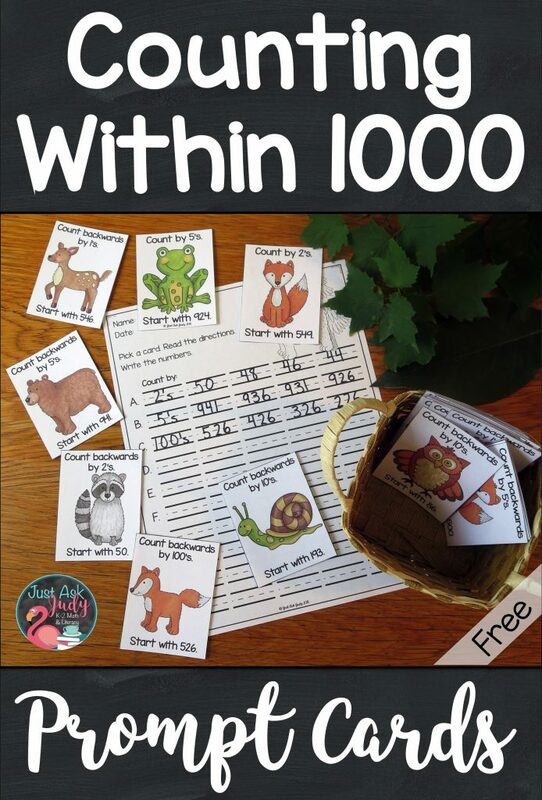 Are you looking for an engaging center activity for counting within 1000? 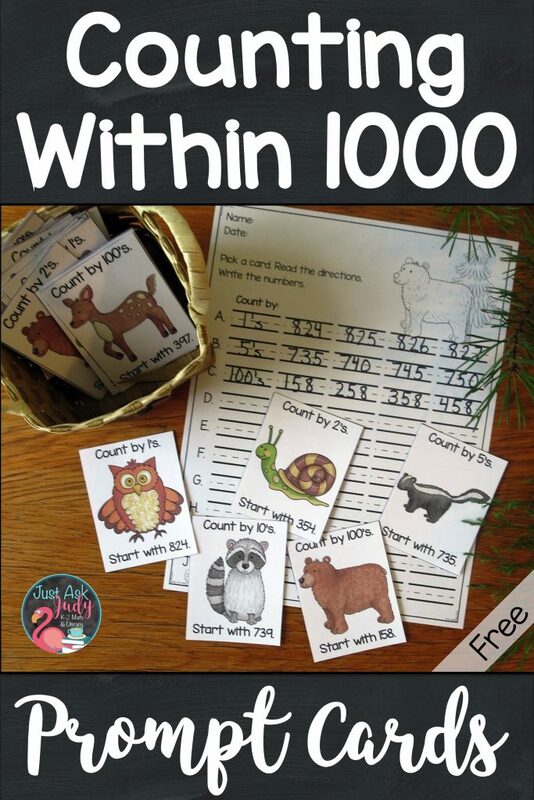 Try this Count Within 1000 Forest Animals Task Card Activity. Check out all my Collect Them All Task Card Activities for three-digit numbers. Read these blog posts with more free activities for 3-digit numbers.